Nothing ruins a commute, flight, or quiet evening at home quite like the sounds of trains, jet engines, and noisy roommates. 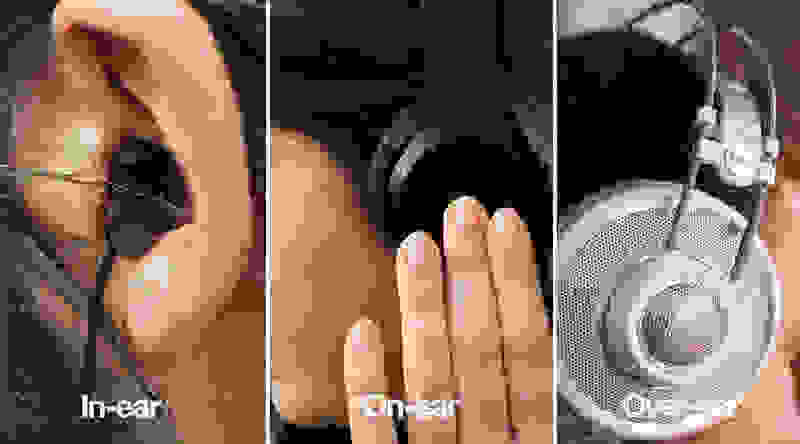 Fortunately for us, there are headphones that tamp down on noise pollution with software that puts your ears in total aural isolation. Noise-cancelling headphones might come at a premium cost, but the benefits are delightful: just you and your music (or podcasts) without the noisiness of the hectic world around you. 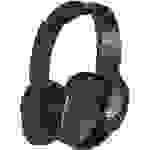 Our current favorite is the Bose QuietComfort 35 (available at Amazon for $349.00). We frequently review noise-cancelling headphones and stack 'em up against one another to see how they compare. Here's a regularly-updates list of the best noise-cancelling headphones right now. Bose has a devoted following, and with a pair of headphones like the QuietComfort 35 Series II, that's not surprising. 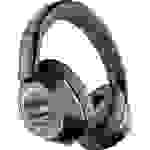 The active noise cancellation (ANC), for which Bose is well-renowned, cuts out a wide range of noises from deep train rumbling to higher-pitched A/C humming. 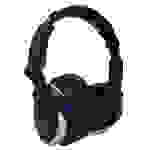 The headphones are light and comfortable enough that they can be worn for hours at a time, although you may notice some heat or sweat build up from where the cushy leather pads meet the sides of your head. The 20-hour battery life is also a huge selling point. We tested the Bose QC35 Series I; really the only difference between the series I and series II is that with the series II, you can also activate and command the Google Assistant. One tricky point is that, should you decide you don't want to use the ANC (for safety reasons or otherwise), you'll have to plug in and use them as wired headphones, since the Bluetooth switch doubles as the ANC on/off switch. The price is steep; if you have a little bit more disposable income and want an outstanding pair of headphones, this is the pair for you. Read the full review of the QC35 Series I. We test all of our headphones on a head and torso simulator (HATS), a model of a human being from the waist upwards that reproduces how we experience music when we listen to headphones. On our head and torso simulator (HATS), we put these headphones through our usual battery of headphone tests: frequency response, distortion, tracking, leakage, and isolation. 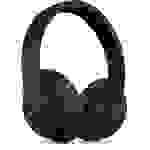 Headphone manufacturers are typically aiming for either a flat or a curved sound profile. A curved profile is most common, and most curved profiles are trying to replicate the Equal Loudness Curve (ELC). The human ear hears higher tones more easily than it hears the bass tones, so for a human to perceive highs and lows at a similar volume, the headphones boost the volume of the lows, and moderate the volume of the highs. A flat profile is usually found in "studio" headphones; the highs, mids, and bass tones have the same volume. However, as I just mentioned, we don't hear all tones at the same volume, so the bass notes sound softer, and the highs sound louder. Some people prefer studio headphones because of their audio fidelity—they are hearing the music exactly as the producers intended them to hear it. Also, as implied by the name, studio headphones are used in studio recordings to help mixers figure out what, if any frequencies, they should boost or reduce. In addition to the more scientific testing, we also wear each pair of headphones around town to get a sense for their features (like extra amps or noise cancellation) and short- and long-term comfort. 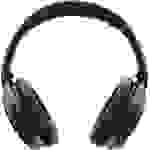 You've probably seen a bunch of different headphones in your every day life, but what you may not realize is that headphones, while they have a number of different selling points, are primarily categorized into three types: in-ear, on-ear, and over-ear. 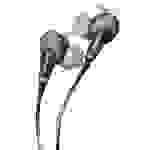 Three popular types of headphones: in-ear, on-ear, and over-ear. JLab Audio is a relatively new player in the headphones game, but they really impressed me with the JLab Audio Flex ANC Wireless. The flat sound profile will please audiophiles who want true music fidelity. Like the Bose QC35, the active noise cancellation on these headphones is unreal. When turned on, it sounds like all of the noise has been sucked out of the room. If I hadn't had my eyes open, I wouldn't have known that a train had arrived at my local train station. Walking on a quiet street with the ANC on feels like floating in outer space, for the amount of ambient noise that reaches your ears. A 30-hour battery life is great for both long days of travel and shorter, more casual use throughout the week. The headphones themselves are very comfortable, but are a bit heavier than the Bose QC35, and have an angled cushion at the top of the headband that tends to dig into the top of your skull after a few hours. Additionally, there have been reports of design flaws in the ear pads, which tear and break off easily. When they unfold, the cups snap out crisply, so be sure to watch your fingers so they don't get pinched. The Flex ANC Wireless has a relatively low price for wireless headphones; you're getting a lot of bang for your buck. We really liked the previous Plantronics Backbeat Pro, so it's probably not surprising that the next edition gets a big thumbs up as well. Like the QC35 and the Flex ANC, the Backbeat Pro 2 also has ANC, but it's less robust than the ANC on those headphones. It minimizes lower-pitched train rumbling, but other sounds are still audible. To some extent, this effect is intentional, since the Backbeat Pro 2 boasts an open-back setting that allows you to easily hear ambient noise, in addition to your tunes. Another unusual feature is sensors that detect when the headphones are being worn, and when they've been taken off. In the latter case, the headphones "auto-pause", and turn back on once the headphones have been returned to your head. I noticed this myself; every time I put the headphones back on, I could hear the ANC turn back on. Some users were unlucky, however, and had defective units that would auto-pause when the headphones were still on their heads. The sound profile is pretty flat, making it possible to hear your tunes without an extra emphasis on certain tones. I thought the call quality was great, but other users had trouble with the mute button (which would never un-mute). The Backbeat Pro 2 are ridiculously comfortable; I had no issues with them after hours of use. If you like comfy headphones, a 24-hour battery life, and tech-y features, then these are the cans for you. 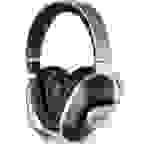 Usually, active noise cancellation (ANC) headphones have difficulty maintaining high audio quality, since, to some extent, your music has to compete with the noise-cancellation algorithm. At this price point, the Audio-Technica ATH-ANC9 headphones did a surprisingly good job at that maintaining that balance. The bass notes are definitely boosted, but not at the expense of the higher notes; you should be able to hear both. However, when the ANC is activated, you may notice that all of the tones sound a bit muted. On the other hand, the active noise cancellation does a really solid job of blocking out the lower frequency tones, which will be really helpful when you don't want to hear trains rumbling or planes humming while you're in transit. If you're curious about ANC, these are a good pair to try out; they'll give you a taste of active noise cancellation without breaking the bank. Read the full review. The Sennheiser Momentum Wireless 2.0 over-ear headphones have a lot of great things going for them: wireless pairing via NFC or Bluetooth, active noise cancellation, a 22-hour battery life, memory foam core ear cups wrapped in leather, and two different cases (a hard-backed case and a soft pouch). With all of these premium features, though, expect to pay a premium price. That price may well be worth it to you if you want your next pair of headphones to have both a sleek design and convenient features. The active noise cancellation (ANC) manages to block out considerable amounts of both higher-pitched and lower-pitched tones, which can really help you to focus when you're out and about in the world. We did notice that the sound profile, which mainly emphasizes the middle tones over the highs or the lows, could get a little fuzzy-sounding when it gets down to the bass, but unless you have especially sensitive hearing, it shouldn't be too noticeable. Even with these minor quibbles, we like the rest of the package enough that we'd definitely recommend the Sennheiser Momentum Wireless 2.0 headphones to any friends of ours with disposable income. Read the full review. 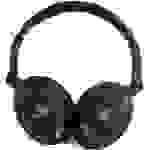 Note: While we didn't have this problem, there have been reports of issues with the Bluetooth connectivity, so if you can, see if you can try a pair out before you commit to the Sennheiser Momentum Wireless 2.0 headphones. Beats is perhaps one of the most (in)famous headphone brands around. The Studio 3 Wireless tries (and largely succeeds) in bridging the gap between a flat, studio-like audio profile (with a slight emphasis on bass) and a portable pair of headphones you can wear around town. The active noise cancellation makes a significant dent in both train rumbling and A/C hums alike. The W1 chip also makes pairing nearly instantaneous with any Apple or iOS device. The Studio 3 Wireless headphones are very comfortable in the short term but can squeeze your head and cause immense heat/sweat build-up in the long run. Between the 22-hour battery life, solid noise cancellation, and sleek aesthetic, it's understandable why some people are willing to drop a lot of cash on these headphones, which serve a dual purpose as a pair of headphones and a fashion statement. The Mixcder E7 originally hail from the UK, and are among the cheapest wireless over-ear headphones I’ve ever seen. These lightweight headphones are aiming for studio-grade sound, and have a very flat audio profile that only slightly emphasizes some of the higher-pitched tones. These headphones sound reasonably good, but the volume range is a little bit lower than I was expecting. Lower volumes are great for preserving your hearing, but in the meantime, it kind of diminishes the immediacy and urgency of your music. 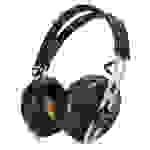 A nice perk is that, despite the low price, the E7 also has active noise cancellation. The ANC blocks out a lot of the lower-pitched humming (such as that of an A/C, or other large devices powered by electricity) that you would hear during a commute or on an airplane. 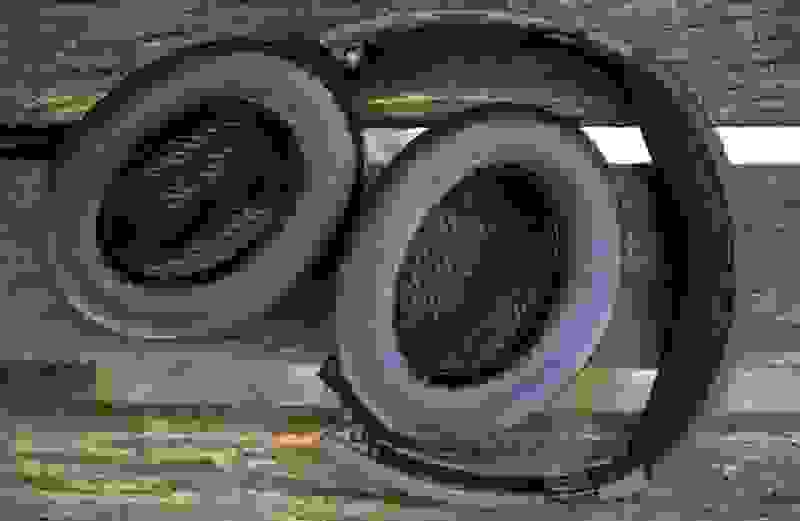 Higher-pitched engine noise, however, is still audible. The ear cups are plush and comfortable, but the headband may dig into the top of your head after a few hours. It’s very easy to switch the E7 from one Bluetooth device to another, and the inline microphone was strong enough so that both myself and the person on the other end of a phone call could hear one another. 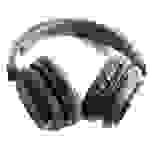 While there is no “pause/play” button on the headphones themselves, the button that do exist are large and easy to operate. Between the 20-hour battery life, the ANC, and the low, low price, these headphones are a great way to dip your toe in to the waters of wireless over-ear headphones without forking over a lot of cash. These over-ear headphones are huge. If you're looking to reproduce the studio headphone experience with no wires, look no further. The Blue Satellite have both the heft and the flat audio profile (with a slight emphasis on the highs) of your favorite studio headphones. In addition to active noise cancellation (which blocks some train rumble, but not all of it), the Satellite also has an AMP setting which instantly boosts the volume and presence of your music. The Satellite is built with high-quality materials, cushy ear pads, and a 24-hour battery life, so what's not to like? The three major issues are the long-term comfort, the controls, and the price. The headphones are so heavy and so rigid that I had a headache a few hours in, and from the looks of the Amazon reviews, I'm not alone. The controls also do not give you audio feedback, so it's tough to tell when the headphones are actively pairing. Lastly, these cans are pretty pricey, and will hurt most peoples' wallets, even if the price is somewhat understandable based on the build quality. When it comes to noise cancellation, lots of people look to Bose to hand over the golden silence—and with good reason. Bose recently added its first compact option to an already well-loved lineup: The QC20i are active noise canceling earbuds that can absolutely crush the clamor of your everyday hustle and bustle. Unfortunately, that level of amazing noise cancellation comes at a price, both in the form of its relatively high cost (especially for in-ears) and the fact that the formidable noise cancellation is powered by its own battery pack, which is at the end of the cable. You can still use the earbuds without the noise cancellation, but either way, because of the cumbersome battery pack, we don't recommend using these in an outdoor or athletic capacity. These are perfect if you need to block out noisy coworkers at your job or upset babies on an airplane. If noise-cancellation is your top priority, though, and you prefer earbuds, these ones won't let you down. Read the full review. If you need a pair of headphones that have both ANC and can stand up to daily wear-and-tear, the ANC7bs are a great candidate. 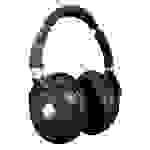 These mid-tier over-ear headphones are have solid noise-cancellation that is better at blocking out higher-pitched noises, like conversation and trains shrieking, than they are at blocking out lower-pitched noises like A/C hum and the rumbling of an airplane. If you find lower-pitched ambient noise more intrusive, you might need to pass these by. Additionally, the bass-heavy sound profile will have some listeners rejoicing, and others straining to better hear the high, clear tones of instrumentals or vocals. Whether you like the sound profile or not, though, these headphones come with a few great extras. Not only do they come with two removable cables, intuitive controls, two adapters, and a sturdy carrying case, but these headphones are also very durable, and will fit snugly on your head. If you treat them right, you might not need to buy another pair of noise cancelling cans for a while. Read the full review. The Panasonic RP-HC800 over-ears are an expensive, sleek pair of headphones that utilize active noise canceling (ANC) technology. Unfortunately, the ANC, which is powered by a single AA battery in one of the ear cups, out-performs the audio fidelity. With the ANC activated, the Panasonic RP-HC800 easily eliminates the sound of babies crying or the rumble of an air conditioner. However, in an attempt to make the bass more audible, the sound profile minimizes the mid-range tones, making it more difficult for you to hear the parts of your music that carry the melody, such as notes from common instrumentals like a guitar or a trumpet. 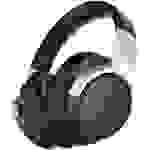 Additionally, when playing music at high volumes, these headphones, despite their large ear pads, tend to leak that sound to the outside world. We recommend that you use these headphones when you're alone in a room, as your music may disturb other passengers in a quiet train car. These headphones have their issues, but if you're a bass-lover who needs to concentrate, the Panasonic RP-HC800 are a great fit. Read the full review. Any pair of noise-cancelling headphones has to be able to 1) block out ambient noise and 2) function as headphones that transmit music to your ears. The Audio-Technica ATH-ANC70 do a pretty good job at both tasks, but there are some trade-offs. Without the ANC, the bass is really de-emphasized, and sounds rather tinny and hollow. With the ANC, though, the reverse is true: the bass gets a boost, but the mids and high-mids are muddied and muffled. On the other hand, these headphones have plush ear pads and a headband that doesn't feel like it's digging into your skull after a couple of hours. The controls are easy to use (even if you have to hunt around for the ANC button), and the ANC is powered by a single AAA battery. These headphones can't be used for wireless playback, but they can be used as wireless isolators (if you really need just peace and quiet) by removing the cable. For commuters who prioritize comfort and noise cancellation over audio fidelity, the Audio-Technica ATH-ANC70 are a solid investment. Read the full review.